I think my ate trained me well. 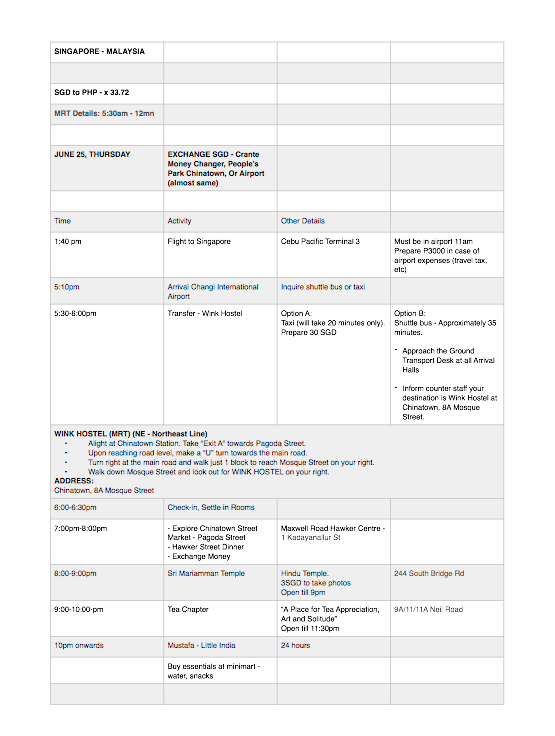 Our itinerary for our past travels (Taiwan and Japan) were always packed, parang walang bukas! I know traveling can either be to relax or explore--but in my case and my age, I'd rather take full action-filled trips before I get old and my feet can't take long walks na! Anyway, for this Singapore trip, I was tasked to do the itinerary. Super naexcite ako. I think I got so used to free-riding my Ate's itinerary so this is something new! I know some would rather yolo their travel schedule "para mas feel na feel", but for me, I don't want to be too spontaneous and waste a lot of time (and even money). So I prepared our SG tour ala my sister - I did a lot of research a week or so before our flight (I learned from the best!). Then I created an excel file with complete list of to-dos, on the dot, with date, time, place, and description (What am I going to see there? Are there entrance fees? What are the best spots to visit if ever the place is too huge to explore in an hour? Etc). Of course, I also took into consideration what my kasama wants to see and do during the trip. I also asked around, interviewing people who have done SG-MY itinerary. Notice that I also placed conversion of SGD to PHP, MRT details (till what time is their MRT? ), options on how to get to our hostel, etc. The spontaneous part here is that I've let go of the time na once I'm there. Hindi din necessary na we have to go to all these places. In a way, this just served as our guide para naman hindi kami nganga sa trip. Singapore was SUPER hot when we visited, mala Pilipinas or maybe even mas sobra coz we were always out walking and exploring. I decided to not wear my assigned "ootd" (polo and jumper), and instead wore a presko t-shirt-cullotes combo. I've always searched for a travel mandals, feeling ko kasi masakit my usual birks. This pair of low Fitflop is a miracle - stylish, made for walking, and most importantly hindi ako nagka-paltos! I chose our hostel based on location (near MRT and tourist spots), price, and quirky-ness. Wink Hostel (read more here) is located in Mosque St., just a block away from Chinatown MRT Station. It is also surrounded with must-visit sites in SG. Since gabi na when we arrived our hostel, we decided to explore nearby Chinatown destinations that close late (part of researching is to find out the opening and closing time of a place you want to visit). One of these is Sri Mariamman Temple, a walking distance attraction in 244 South Bridge Road, which closes at 9pm. In the middle of Chinatown, Singapore is their oldest Hindu temple Sri Mariamman. Constructed in 1827, the temple provided shelter for Indian immigrants during its earlier years. It also formerly hosted Hindu marriages. Today, the temple is known for their October-November Theemithi, or fire-walking ceremony. It is also a popular tourist destination. Entrance is free, but they charge SGD 3 for tourists taking photos. Wearing above the knee shorts and skirts are not permitted inside, but sarongs are available by the entrance. Sri Mariamman Temple is very embellished, intricate and colorful. A total feast in the eyes. At the end of the day, we were invited to join their humble vegetarian feast. It was a nice and authentic experience for our first night, thank you! Another Chinatown destination that closes late (10:30-11pm) is the Tea Chapter at Neil Road; a perfect post-dinner destination. I discovered this place while doing my research via TripAdvisor, and true enough, Tea Chapter is a nice place to relax and enjoy a cup of legit Chinese tea, with a few add-ons to the experience. A tea store is located downstairs. Even the Queen enjoyed her cup of tea at the Tea Chapter. Nice dining area at the second floor. A bit costly at Php 600 for a pack of tea leaves, the preparation and ritual that comes with the visit were well-worth the price. Tea Chapter's Stanley also taught us dos and dont's and other interesting tidbits on Chinese tea tradition. I'll never drink tea the same way again! The name itself sparked my curiosity - it literally houses the sacred Buddha tooth relic! Located in 288 South Bridge Road, Chinatown, the Buddha Tooth Relic Temple is huge and rich in Buddhist art and culture. Entrance is free but they accept donations, and the temple is open from 7am to 7pm. It was our first agenda on our first full day in Singapore. Interesting exhibit of Buddha's different forms. Some areas do not allow flash photography, while other do not allow taking pictures at all (relics section). Be mindful of the signs. At the top floor is the wheel of fate plus a nice rooftop garden where you can relax. Another great decision for staying in Chinatown is that there are so much HAWKER complexes in the area! Hawkers are open-air food stalls selling cheap, local cuisines. After touring the huge Buddha Tooth Relic Temple, we had lunch first at the Maxwell Food Centre. Buddha Tooth Relic is located in Sago Street, aka Street of the Dead because it used to be lined with Death Houses for old, poor, Chinese immigrants. Street art and street artist. Maxwell Food Centre. I paid only SGD 2.50 for my lunch! We utilized the MRT for our tour day, so I highly recommend you also get the Singapore Tourist Pass. A ticket costs SGD 10 (1 Day), SGD 16 (2 Days), and SGD 20 (3 Days) + an extra refundable SGD 10. A day's counting is not by 24 hours, but the ticket will last till the closing of the MRT on the date you bought it. Also, download the very useful SG MRT app. Aside from the train map, it also features route recommendations. Located between Arab Street and Bali Lane, Haji Lane is around 3 minutes away from Bugis MRT station. Said to be the Cubao X of Singapore, I made sure to include this in our itinerary. Pang "Hipster" daw e, haha! True enough, the street is lined with indie shops, art, and cafes. This is an interesting shop with lots of handmade knick-knacks. Very inspiring, and made me want to put-up an Anagon shop again! Didn't buy anything (budget trip! ), but Paul went gaga in this toy store. He bought a Superman Minion collectible (original). It was super hot that day, we had several stop overs and entered a lot of stores just for the aircon (haha). We ended our Haji Lane tour in this cool themed cafe called Shop Wonderland. I've been to Orchard Road and ION Orchard Mall before, but with research I learned about sites in the area that we can go to for free. Inside ION Orchard Mall, at the 4th floor, is the ION Art Gallery. The space is dedicated to international and local exhibitions, and no entrance fees! During our visit, paintings (mostly oil and water color) from Da Tang Fine Arts were on display. At the 56th floor of ION Orchard Mall is the ION SKY - a viewing area of Singapore's 360. Ion Sky is open from 3pm-6pm (last entry is at 5:30). Usually, viewing decks have entrance fees, but ION Sky is for FREE! Aside from the view, quotes and landmarks are etched on the glass walls of the ION Sky. Very IG-worthy, hehe. Of course, an Orchard Road visit is not complete without roaming around the streets, checking out their luxury stores, and trying the dollar ice cream sandwich! Although SGD 1.20 na siya ngayon, Tumataas ang bilihin! Hehehe. There's so much things to do when you're in Marina Bay Sands area, but you have to know their schedules. We had a packed day, so we opted for the shows or exhibits sana (they have DreamWorks Animation exhibit at the ArtScience Museum that day), but sayang it was closed na when we got there (around 6pm). We decided to just go around the mall, and even rest for a while. You can check out Marina Bay Sands website for their list of shops, entertainment, casino, hotel, restaurants, etc. Marina Bay Sands is nearer the Bayfront MRT Station. Aside from the mall, they have a huge outdoor area that you can explore for FREE. Gardens by the Bay have the Cloud Forest, Dragonfly & Kingfisher Lakes, World of Plants, Heritage Gardens, Sun Pavillion, etcetera. We opted to check out the SuperTree Grove. These uniquely designed giant trees are vertical gardens of 25 to 50 meters tall. They are extra-beautiful with all the lights at night. We almost got lost looking for the Singapore River Explorer! The ticketing office is located near Marina Bay Sands, but under a bridge past the iconic Louis Vuitton store. Aside from the usual river tour, Singapore River Explorer is also a mode of transportation with different stops or stations. We decided to go from Marina Bay Sands to Clarke Quay in a jetty! In a way, riding the jetty is also an instant tour of Singapore's highlights. This is perfect for those with time constraints like us - at least nakapag tour din kami kahit papaano. We saw the durian-shaped Esplanade, a performing arts centre. And our stop, the Clarke Quay, which houses Singapore's nightclubs and restaurants. You can have dinner and drinks in the area. Find out more about the Singapore River Explorer's schedules and rates here. Just next to our hostel is a cat cafe! We ended the long day with tea and refreshing fruit juice, with "The Company of Cats". With the curious cat, Lulu! I've always been a dog person, but I love all kinds of animals. Lulu is the sweetest for me, hindi siya nansscratch. Hehe! Get to know some of the resident cats! Since we were the last customers for the day, we were also lucky to meet and talk with the Chief Cat Lady Tay Shuyun. We learned that all of their cats are rescues; they were previously either strays or abandoned. When I heard this story, I am so glad we made the visit! It was hard to leave, but the cats have to rest! Make sure to visit them when you're in Chinatown, Singapore (details here). So we survived a day touring the city of "cultural melting pot". What I love about Singapore is that you get to enjoy the best of both worlds: Hindu and Chinese temples for an hour or so, then just get on a train to see the advance luxe skyscrapers side of the city! It is small, but has plenty of variety when it comes to sight, taste, and experience. Worth it ang sakit ng paa! Thank you also to my travel buddy Paul for keeping up with my very ambitious itinerary! Haha! To a travel blog, and our next travels!